*Seanair is pronounced approximately as "SHEN-er" with the accent on the first syllable. Cascade 220[100% wool; 220yd/201m per 100g skein]; color: Natural; 8[9, 10, 11, 12, 13, 13] skeins; or about 1625[1825, 2100, 2350, 2550, 2725, 2900] yards of worsted weight wool. 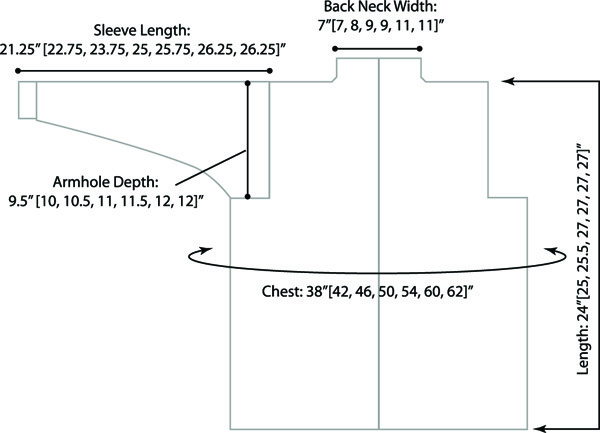 Note: Length of zipper depends on the length of the front plus the length of the collar. Custom zippers can be ordered online for a reasonable price. 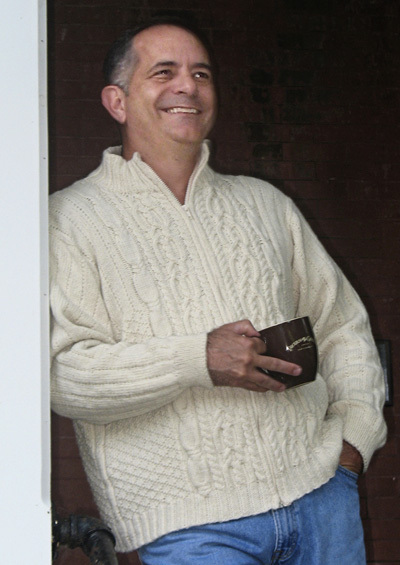 But it may be wise to wait until the sweater is finished to purchase. Instead of using a cable needle, you may wish to work cables without a cable needle. T2R: Slip next st to cn and hold to back of work; k1, then k1 from cn. 2/2 RC: Slip next 2 st to cn and hold to back of work; k2, then k2 from cn. 2/2 LC: Slip next 2 st to cn and hold to front of work; k2, then k2 from cn. 2/2 RPC: Slip next 2 st to cn and hold to back of work; k2, then p2 from cn. 2/2 LPC: Slip next 2 st to cn and hold to front of work; p2, then k2 from cn. Row 1 (RS): K3, *p1, k5, rep from * to last 4 sts, p1, k3. Row 2 (WS): P2, *k1, p1, k1, p3, rep from * to last 5 sts, k1, p1, k1, p2. Row 3: K1, *P1, k3, p1, k1, rep from * repeat to end. Row 4: K1, *P5, k1, rep from * to end. Note that the SDTS will not be in sync with the cable pattern. 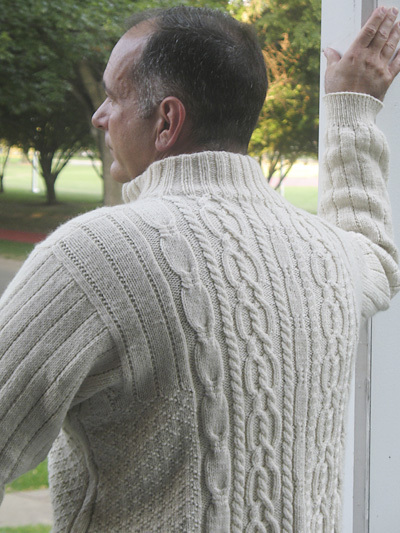 This texture stitch has a 6-row repeat and the cable pattern has a 20-row repeat. Row 1 (RS): K3, *p1, k5, rep from * to last 4 sts, end p1, k3. Rnd 1: [P1, k5], rep to end. Row 1 (RS): K2, p2, 2/2LC, p2, k2, p4, 2/2LC, p4, k2, p2, 2/2LC, p3, 2/2RC, 2/2LC, p3. Row 2 and all wrong-side rows: K the knit sts and P the purl sts. Row 3: K2, p2, k4, p2, k2, p4, k4, p4, k2, p2, k4, p3, 2/2RC, 2/2LC, p3. Row 7: K2, p2, k4, p2, k2, p4, k4, p4, k2, p2, k4, p3, k8, p3. Row 9: K2, p2, 2/2LC, p2, k2, p4, 2/2LC, p4, k2, p2, 2/2LC, p3, k8, p3. Row 11: K2, p2, k4, p2, (2/2LPC, 2/2RPC) twice, p2, k4, p3, k8, p3. Row 13: K2, p2, (2/2LC, p4) twice, 2/2RC, p4, 2/2LC, p3, k8, p3. Row 15: K2, p2 (k4, p4) 3 times, k4, p3, k8, p3. Row 19: K2, Ps, k4, p2, (2/2RPC, 2/2LPC) twice, p2, k4, p3, k8, p3. Row 20: As Row 2. Row 1 (RS): P3, 2/2RC, 2/2LC, p3, 2/2RC, p2, k2, p4, 2/2RC, p4, k2, p2, 2/2RC, p2, T2R. Row 3: P3, 2/2RC, 2/2LC, p3, k4, p2, k2, p4, k4, p4, k2, p2, k4, p2, T2R. Row 7: P3, k8, p3, k4, p2, k2, p4, k4, p4, k2, p2, k4, p2, k2. Row 9: P3, k8, p3, 2/2RC, p2, k2, p4, 2.2RC, p4, k2, p2, 2/2RC, p2, k2. Row 11: P3, k8, p3, k4, p2, (2/2LPC, 2/2RPC) twice, p2, k4, p2, k2. Row 13: P3, k8, p3, 2/2RC, p4 2/2LC, (p4, 2/2RC) twice, 2/2RC, p2, k2. Row 15: P3, k8, p3, (k4, p4) 3 times, k4, p2, k2. Row 19: P3, k8, p3, k4, p2, (2/2RPC, 2/2LPC) twice, p2, k4, p2, k2. Row 1 (RS): T2R, p2, 2/2LC, p2, k2, p4, 2/2LC, p4, k2, p2, 2/2LC, p3, 2/2RC, 2/2Lc, p3. Row 3: T2R, p2, k4, p2, k2, p4, k4, p4, k2, p2, k4, p3, 2/2RC, 2/2LC, p3. Row 7: K2, p2, k4, p2, k2, p4, k4, p4, k2, p2, k4, k8, p3. Row 15: K2, p2, (k4, p4) 3 times, k4, p3, k8, p3. Row 19: K2, p4, k4, p2, (2/2RPC, 2/2LPC) twice, p2, k4, p3, k8, p3. Row 1 (RS): P3, 2/2RC, 2/2LC, p3, 2/2RC, p2, k2, p4, 2/2RC, p4, k2, p2, 2/2RC, p2, k2. Row 3: P3, 2/2RC, 2/2LC, p3, k4, p2, k2, p4, k4, p4, k2, p2, k4, p2, k2. Row 9: P3, k8, p3, 2/2RC, p2, k2, Pf, 2.2RC, p4, k2, p2, 2/2RC, p2, k2. Row 13: P3, k8, p3, 2/2RC, p4, 2/2LC, (p4, 2/2RC) twice, , p2, k2. CO 216[248, 264, 296, 312, 344, 360] sts. Rows 1 and 3 (RS): *(K2, p2) to 2 sts before the first marker, k2, SM, k2, p2, rep from * twice, (k2, p2) to last 2 sts, end k2. There are 4 knit sts at each marker (2 on each side of the marker). Rows 5, 7 and 9: *Continue in rib as set to 2 sts before the first marker, T2R, SM, T2R, p2, rep from * twice, rib to last 2 sts, k2. Row 11 (and all following odd-numbered rows until rib depth is met): As Row 1. Work ribbing as set until piece measures 2[2, 2.25, 2.25, 2.5, 2.5, 2.5] inches from CO edge and ending after a WS row. Set-Up Row (RS): *K2, p2, M1, k2, M1, p2, k2, M1p, p2, M1p, M1, k2, M1, M1p, p2, M1p, k2, p2, M1, k2, M1, p2, M1p, (k2, M1) twice, k2, M1p, p2; work Small Diamond Texture Stitch (SDTS) over the next 18[-, 30, -, 42, -, 54] sts, M1, p2, k4 (slipping marker in between), p2, M1, work SDTS over the next 18[-, 30, -, 42, -, 54] sts (starting with k2 instead of k3 because the M1 counts as the first k st). p2, M1p, (k2, M1) twice, M1p, p2, M1, k2, M1, p2, k2, M1p, p2, M1p, M1, k2, M1, M1p, p2, M1p, k2, p2, M1, k2, M1, p2, k2, repeat from * for the second half of the sts, slipping markers as you come to them. 276[-, 324, -, 372, -, 420] sts. Set-Up Row (RS): *K2, p2, M1, k2, M1, p2, k2, M1p, p2, M1p, M1, k2, M1, M1p, p2, M1p, k2, p2, M1, k2, M1, p2, M1p, (k2, M1) twice, k2, M1p, p2; work Small Diamond Texture Stitch (SDTS) over the next -[24, -, 36, -, 48, -] sts, k2tog, p2, k4 (slipping marker in between), p2, ssk, work SDTS over the next -[24, -, 36, -, 48, -] sts, (starting with k2 instead of k3 because the ssk counts as the first k st). p2, M1p,(k2, M1) twice, M1p, p2, M1, k2, M1, p2, k2, M1p, p2, M1p, M1, k2, M1, M1p, p2, M1p, k2, p2, M1, k2, M1, p2, k2, repeat from * for the second half of the sts, slipping markers as you come to them. -[300, -, 348, -, 396, -] sts. Next row (and all WS rows): In all sections except SDTS, K the knit sts and P the purl sts as they appear. Work the SDTS pattern WS rows as set from chart or text. Use markers to set off these sections if desired. Next row: Begin working the cable panels with Row 1 as follows: Right Front Panel, SDTS to last 4 sts before side marker, p2, T2R, SM, T2R, p2, SDTS to 46 sts before center back marker, Right Back Panel, Left Back Panel, SDTS to last 4 sts before side marker, p2, T2R, SM T2R, p2, SDTS to 46 sts before end, Left Front Panel. Work the cabled sections and the SDTS sections as set until work measures 14[14.5, 14.5, 15.5, 15.5, 15, 15] inches from CO edge, or about 1 inch less than length desired to underarm. When you come to the next Row 1 of the SDTS, begin working Wide Garter Rib Stitch starting with k3, p1. This will complete the diamond and align the purls of the rib with the small diamonds. Continue working as set until work measures 15[15.5, 15.5, 16.5, 16.5, 16, 16] inches from CO edge, ending after a RS row. With WS facing, *work as set to 8[10, 14, 14, 15, 16, 16] sts after the side seam marker, transfer the last 16[20, 28, 28, 30, 32, 32] sts worked to a holder or scrap yarn, rep once from *, work in patterns to end. Place the 61[65, 67, 73, 78, 83, 89] sts for each front half on holders. 122[130, 134, 146, 156, 166, 178] sts on the needle for back panel. Attach yarn with RS facing, and work Back Cable panels and Wide Garter Rib as set until back measures 9.5[10, 10.5, 11, 11.5, 12, 12] inches from beginning of armholes, ending after a WS row. Next row (RS): Work Wide Garter Rib as set to the right-hand edge of the cable panel (begins with 3 purl sts), P1, p2tog, ssk, k4, k2tog, p2tog, P1, ssk, k2tog, p2, k2, (p2tog) twice, ssk, k2tog, (p2tog) twice, k2, p2, ssk, k2tog, p2, k4 (slip center back marker), p2, ssk, k2tog, p2, k2, (p2tog) twice, ssk, k2tog, (p2tog) twice, k2, p2, ssk, k2tog, p1, p2tog, ssk, k4, k2tog, p2tog, p1; work Wide Garter Rib as set to the end (28 sts decreased). There should be 94[102, 106, 118, 128, 138, 150] sts remaining. Transfer sts to holders as follows: 26[30, 30, 32, 35, 37, 42] sts each for Right and Left Shoulders and 42[42, 46, 54, 58, 64, 66] sts for back neck. Transfer the 61[65, 67, 73, 78, 83, 89] held sts onto the larger needles and join yarn with RS facing. Continue working as for upper back until work measures approximately 6.75[7.25, 7.75, 7.75, 8.25, 8.25, 8.25] inches from division of armholes, or about 2.75[2.75, 2.75, 3.25, 3.25, 3.75, 3.75] inches from full depth of armhole and ending after a WS row. With RS facing, decrease across the cable panel as follows: k2, p2, ssk, k2tog, p2, k2, (p2tog) twice, ssk, k2tog, (p2tog) twice, k2, p2, ssk, k2tog, p2, p2tog, ssk, k4, k2tog, p2tog, p1 (14 sts decreased); then finish rem sts with Wide Garter Rib. 47[51, 53, 59, 64, 69, 75] sts. Work 1 WS row as set. Next row (RS):BO 10[10, 12, 12, 14, 15, 16] sts, work to the end as set. BO 3 sts at the beginning of the next 2 RS rows (all sizes), then BO 2 sts at the beginning of the next 1[1, 1, 3, 3, 4, 4] RS row(s). Dec 1 st at the neck edge on the next 3 RS rows (all sizes). 26[30, 30, 32, 35, 37, 42] sts. Work as set until piece measures the same as the back. Place sts on holder. Transfer the 61[65, 67, 73, 78, 83, 89] held sts onto the larger needles and join yarn with RS facing. Continue working as for upper back until work measures approximately 6.75[7.25, 7.75, 7.75, 8.25, 8.25, 8.25] inches from division of armholes, or about 2.75[2.75, 2.75, 3.25, 3.25, 3.75, 3.75] inches from full depth of armhole and ending after a WS row. With RS facing, work Wide Garter Rib to cable panel, then decrease as follows: p1, p2tog, ssk, k4, k2tog, p2tog, P1, ssk, k2tog, p2, k2, (p2tog) twice, ssk, k2tog, (p2tog) twice, k2, p2, ssk, k2tog, p2, k2. 47[51, 53, 59, 64, 69, 75] sts. Next row (WS):BO 10[10, 12, 12, 14, 15, 16] sts, work to the end as set. BO 3 sts at the beginning of the next 2 WS rows (all sizes), then BO 2 sts at the beginning of the next 1[1, 1, 3, 3, 4, 4] WS row(s). Work as set until piece measures the same as the back. 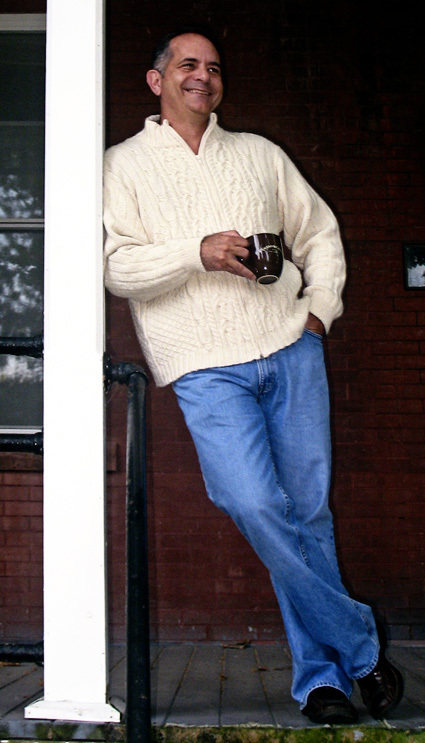 With right sides touching, work three-needle bind-off on shoulder stitches to join them. Turn RS out to begin sleeves. Slide underarm sts onto 16-inch US 6/4.0mm circular needle. Pick up and knit 1 st at the end of that row of sts, PM, then pick up and knit 45[48, 51, 51, 54, 54, 54] sts along armhole edge (approximately 3 sts for every 4 rows), pick up and knit 1 st at the top center of the shoulder, 45[48, 51, 51, 54, 54, 54] sts along the next armhole edge (same as on the first armhole edge), PM, pick up and knit 1 more st. You should have 109 [119, 137, 137, 147, 147, 151] sts total. Work across the underarm gusset sts (between the markers) as set, SM, work Wide Garter Rib pattern st centered over the next 91[99, 103, 103, 109, 109, 109] sts, which brings you to the end of the round. Note: Remember to keep up the two T2R motif sts which are at the center of the underarm and flanked by 2 purl sts on each side. This motif recurs as it did in the body of the cardigan on Rnds 1, 3, and 5 of every 20-round repeat. Rnd 1: Ssk, work as set to 8-st underarm motif, p2, k4 (or T2R twice as the patt demands), p2, work as set to 2 sts before marker, k2tog (2 sts decreased). Rnd 2: Work all sts as set (no decreases). Work these 2 rounds until all underarm gusset sts (except 8-st underarm motif sts) have been decreased (remove markers at last decrease). 99[107, 111, 111, 117, 117, 117] sts including 8-st underarm motif. Work 5[5, 3, 4, 3, 3, 3] rnds even. Repeat the last 6[6, 4, 5, 4, 4, 4] rnds 1[12, 11, 17, 9, 0, 10] more times. Work a Decrease Rnd followed by 6[6, 4, 5, 4, 4, 4] even rnds 20[12, 22, 13, 26, 34, 26] times. Change to smallest needles and, beginning 1 st before the 8-stitch underarm motif: K1, p2tog, k1, k2tog, k1, p2tog, (k1, p1) to the end of the round. Then work 17 rnds of 1x1 rib. Work suspended bind-off in pattern. Note: Plan before you start. 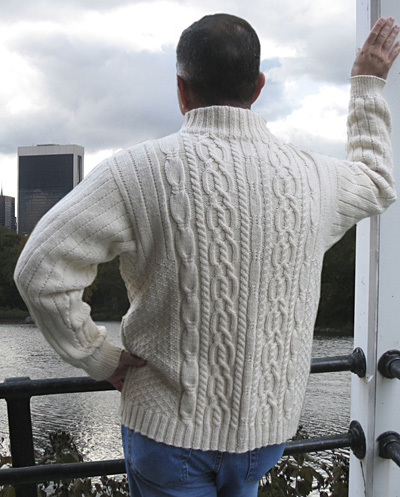 The object of picking up stitches along the front neck edges is to continue the 2 x 2 ribbing pattern straight up from the cable motifs in front and back. Use markers if it helps, but figure out where the 2 x 2 rib stitching will be obvious to work, then plan the number of stitches you will need along the non-cabled edges to accomplish the design goal. With RS facing and starting at the right-hand edge of the Right Front neck edge, use the larger needle to pick up and knit sts along the Right Front Neck Edge. Slide sts held off for the back neck onto a holder and work 2 x 2 rib over these sts being certain to start appropriately so that the rib motif joins appropriately to the cable motif sts. 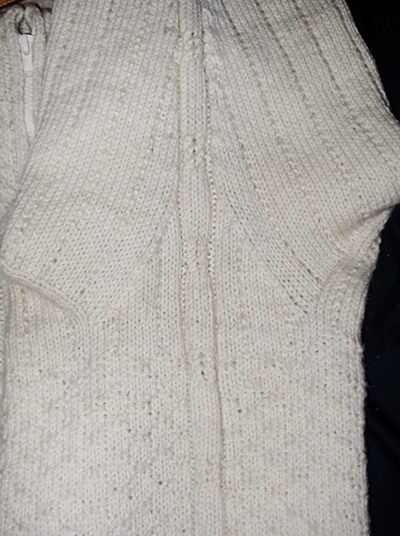 Then pick up and knit the same number of sts along the Left Front Neck Edge as for the Right Front. Turn work and begin 2 x 2 rib across all sts. When collar measures about 3 inches in length, change to smaller needles and work in the collar facing in St st for about 3 inches, then bind off. Note: Remember that changing to the smaller needles means you might need to work 1 or 2 extra rows in St st to achieve the same length. Work in all ends. Block the cardigan to finished dimensions. Use pins to fold over the collar facing and to secure the edges; this will be a great help when it comes time to sew in the zipper and sew down the facing. When cardigan is dry, use straight pins to baste the zipper into place. Sew both sides. Note: The column of p2 (RS) sts is an excellent anchor for sewing in the zipper. I took a length of the Cascade 200 yarn and split it in two (2 plies each) and threaded it into a thinner needle (the size used for needlepoint or petite point). First I used a whip-stitch to baste the zipper to the ribbing, then I back-stitched the zipper to secure it in place. All of the stitches are "buried" in the RS columns of purl stitches near the center fronts. After the zipper is stitched in place, fold down the collar facing and pin baste it (to secure it for stitching). The short edges of the facing should cover the edges of the zipper where itâ€™s attached to the collar. The long edge lays flat along the line where the collar stitches were picked up. 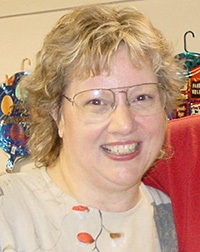 Judith Brodnicki is a full-time graphic artist and avid knitter. She lives in Omaha, Nebraska, with her husband, 2 cats and 2 black Labs (the latter of whom were banned from the guest room while the cardigan was blocked) .